The Caring Medical Library: Information to help you maximize your health! The fourth edition of Prolo Your Pain Away includes original material from the previous editions that explain all about Prolotherapy and how it is used to permanently alleviate pain from arthritis, sports injuries, and all types of chronic pain conditions! Plus, it takes an expanded look at the medical literature and patient studies on Regenerative Medicine: Prolotherapy, Platelet Rich Plasma, Stem Cell Therapy, and more! This book is written for both the lay public and medical professionals to gain a better understanding of the applications of these treatments, as well as how ligament laxity leads to joint instability which is the underlying problem in nearly all chronic pain cases. Additionally, it helps the reader gain a better understanding of the nerve component in all types of pain conditions, and how some treatments, like Nerve Release Injection Therapy, are used to provide instant pain relief from nerve entrapments. For those interested in learning about Regenerative Medicine for pain, this book is a must read! 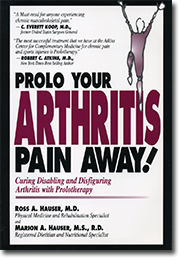 The third edition of Prolo Your Pain Away, the book that helped put Prolotherapy on the map for the lay person with chronic pain. This book explains all about Prolotherapy: its history, its use as an alternative to surgery, how it compares to other pain management options, and much more. Learn how Prolotherapy works to restore injured and painful joint conditions, in addition to the true root cause of many chronic pain conditions, from common knee arthritis to more rare and tough cases of Reflex Sympathetic Dystrophy/CRPS, hypermobility from Ehlers-Danlos syndrome, and a host of others. Lastly, this book discusses the power of diet and nutritional supplements, Natural Medicine, and the mind/body/spirit connection in healing. The Hauser Diet: A Fresh Look at Healthy Living! This book reveals that each of us needs to follow an individualized diet. If you’ve tried and failed at other diets, we will explain the reason why! With over 15 years of clinical experience, Ross and Marion Hauser developed an advanced form of Diet Typing to help start their patients on to wellness. Learn how blood pH and glucose tolerance testing can scientifically determine which diet is best for a person. 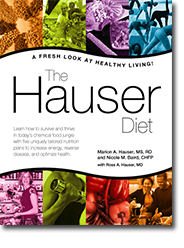 The Hauser Diet will show you how to choose healthy, great tasting foods and cook according to your Diet Type. The Hauser Diet focuses on real food and real answers to the age old question: What diet is best for me? 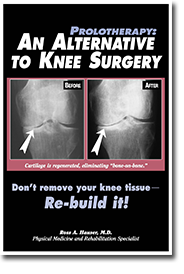 Trying to avoid knee surgery? We can help! This Prolotherapy book zeroes in on one of the most over-utilized and costly medical procedure done today: knee surgery. Arthroscopy, partial knee replacements, full replacements, meniscectomies, and more are discussed. More importantly, how Prolotherapy can be the preferred non-surgical alternative to keep an athlete playing without time off for surgery and stop the steroid shot cycle for good. If you have been told that you need surgery because of an athletic injury or arthritis, and want a second opinion before having to give up your athletic aspirations, livelihood, or favorite hobbies, this book is for you. 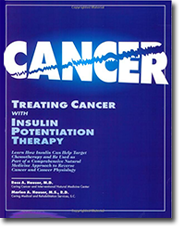 This book describes the targeted, low dose chemotherapy treatment known as Insulin Potentiation Therapy. Described throughout its chapters is the history of the treatment, and the science behind it, as well as case studies. Cancer physiology itself is dissected in order to provide nutritional and natural medicine insight for those battling cancer. 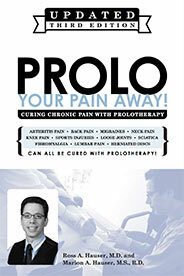 Prolo Your Sports Injuries Away! Our 900 page book is serious help for injured athletes! It’s great for an athlete or coach who wants to know more about the numerous types of injuries that can be treated by Prolotherapy. 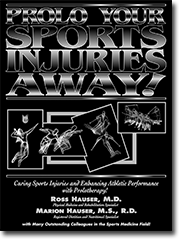 Also in this book, the 20 myths of sports medicine including the myths of anti-inflammatory medications; why cortisone shots actually weaken tissue; how ice, rest, and immobilization may actually hurt the athlete; why the common practice of taping and bracing do not stabilize injured areas; and why the arthroscope is one of athletes’ worst nightmares. This book has numerous contributions from leaders in both the Prolotherapy and athletic arenas. Prolo Your Arthritis Pain Away! If you have been told that you have arthritis, you have likely been given options that include pain medicine, surgery, or steroid injections. The problem is these do nothing to actually help the arthritis, and, in fact, produce faster degeneration of the arthritic joint. 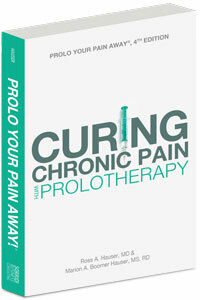 This Prolotherapy book is part of the 4-part mini-series based on Prolo Your Pain Away and focuses on the true cause of arthritis: weakened ligaments. More importantly, how Prolotherapy, a regenerative treatment, can help to permanently relieve pain, reverse cartilage damage, and offer an alternative to surgery. Osteoarthritis does not need to be thought of as a hopeless, debilitating disease—Prolotherapy gives hope for regaining motion and independence! Prolo Your Back Pain Away! While back pain will affect most of us at some point in our lives, the pain does not have to become permanent or lead down the road to pain medication, cortisone shots, and surgery. 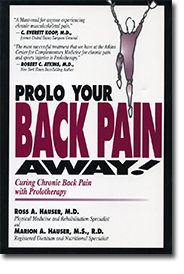 Prolo Your Pain Away, examines the true culprit behind back pain: weakened ligaments. It explains how the degenerative effects of injury and traditional care for back pain actually perpetuate the cycle, and how regenerative injection treatments can help stop and reverse it. In addition, you will learn the truth behind common misdiagnoses of sciatica and other referral pain conditions. If you have been told that your back pain can only be “managed” or your pain is due to “getting old,” then read this book. Whether your discs are degenerated, bulging, herniated, or you’ve already had a fusion or other failed surgery, Prolotherapy can help! Prolo Your Headache and Neck Pain Away! 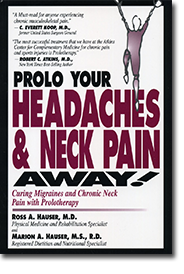 Get to the root cause of most headache and neck pain with this book, which was part of the 4-part mini-series based on Prolo Your Pain Away! Cervical instability due to ligament injury is an under-diagnosed issue with people suffering from chronic headaches, migraines, and other symptoms that can be caused when the vertebrae are not properly supported. Learn about a lesser-known syndrome called Barré -Liéou Syndrome, which is one of the most common causes of headaches, ringing in the ears, sinus pressure, dizziness, and facial pain. This book also delves further into other chronic pain caused by ligament laxity and forward head posture. When ligament injury is treated properly with Prolotherapy, the symptoms of headaches, neck pain and tension, among many others, can all be relieved. 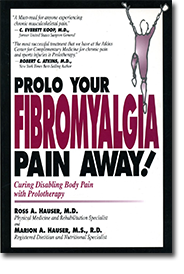 Prolo Your Fibromyalgia Pain Away! This book is part of a 4-part mini-series based on the original Prolo Your Pain Away! An epidemic number of people in the United States wake up in the morning feeling tired, sore, and achy. Upon physical examination, tender points are found all over the body. Many people with these complaints are prescribed muscle relaxers and antidepressant medication. They are told nothing can be done to cure the problem. But that is not necessarily the truth. In fact, most people we treat with fibromyalgia respond to Prolotherapy and Natural Medicine interventions.